Everyone has their pieties, even nonbelievers. It's how we respond when we see them debased that underlines who we are. That's why the responses to fashion house Benetton's latest ad campaign have been so depressingly predictable. In fact it's why Benetton supported the campaign at all. 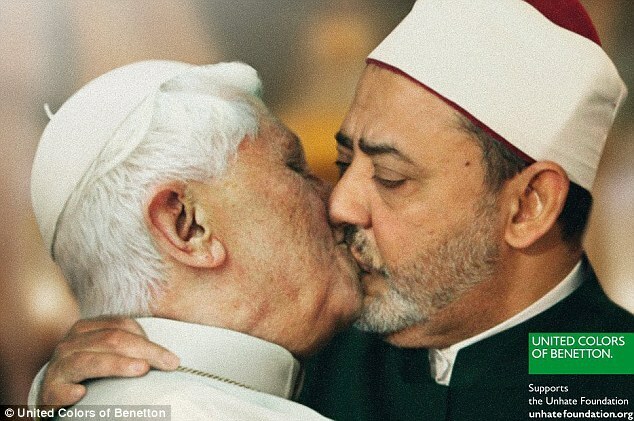 When Benetton signed off on a provocative image of Pope Benedict passionately kissing an Iman they knew (in fact they were depending) on the controversy it would create among a lot of people. They got exactly what they asked for, too. Along with the controversy, they have promoted the Benetton brand. They're riding some people's outrage all the way to the cash registers. But consider this, if you're a believer, then you believe that God created the vast and unfathomable universe. From the smallest leaf to the mightiest mountain, from a comet to a quasar, it's all His work. So it's quite hard, given all that, to imagine He'd be bothered by a tacky ad campaign, isn't it? And it's unlikely He needs your support at all. That disconnect - between the majesty of creation and the small thinking of the many who attribute it to a God - has always puzzled me.